Torture on the Trainer - Grin & Bear it! Snow - Shovel - More snow - More shoveling...It's a literal mess out there. As we await warmer weather and sunny skies, I'm sure many of you are enduring countless hours on the trainer - or at least pondering it. Everyone's got their own recipe for enduring their preferred torture session, and we all have our own setups. Mine's in a room no one visits because it's a horror show. I have my fan set up, my old clunker in the trainer (don't want to put my Carbon fiber there due to the dangerous forces), my Accelerade mix in the cage and some Electronic trance music on the Ipod ( I get mine from E-music - they have 78 minute mixes). But the most important item is my Polar HRM, which I use to time my change-ups and measure and plot my HR. This way, I can measure my time in the various zones, plot my Min/Max/Average and record total calories. 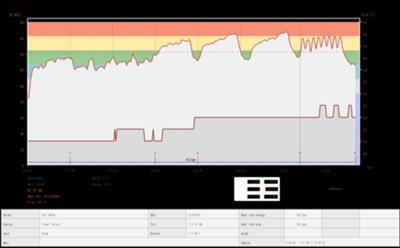 My session pretty much involves a 10m warmup, followed by (ugh) single leg alternates for 4m in high hear, then a long climb, followed by 2 long progressions and capped off with 8x30 second interval sprints. Something for everyone, no doubt, with appropriate recovery sessions in between. You have to be motivated and driven to make it through, and my trick is that when it's unbearable...when I can't take it anymore...when the pain is unreal and my heart is pounding..Smile...For some reason, this fools my body. Hey - it works for me. I always cap it off with a good warm-up. Hope your off-season is humming along. Looking forward to the season and coming out stronger than when I entered the Off season.